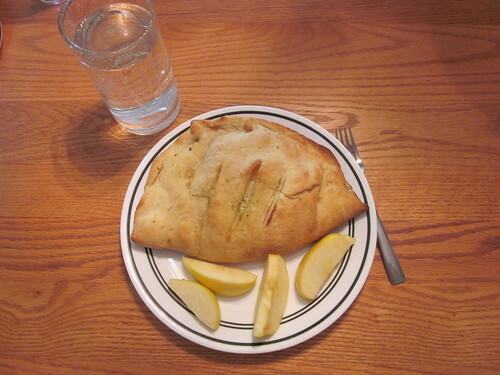 This week, I’m going to take two previous food articles (chicken, broccoli, and mozzarella calzones and fried rice with artichoke hearts) and smash them together, creating my single favorite meal I’ve found since going vegan. Seriously. I’ve enjoyed these calzones more than anything else I’ve tried. So, yes, along the way, I’ll be pulling elements from both of the previous posts and combining them into a new one. For the calzone crust itself, you’ll need roughly 1 1/2 cups flour, 3 tablespoons of extra virgin olive oil, 2/3 teaspoon yeast, 1/3 teaspoon salt, and 2/3 cup water per calzone that you intend to make. These will make very large calzones, so don’t be afraid to divide the recipe in half if you want small ones. Generally, a single calzone will make two meals for me. You’ll also need the ingredients. 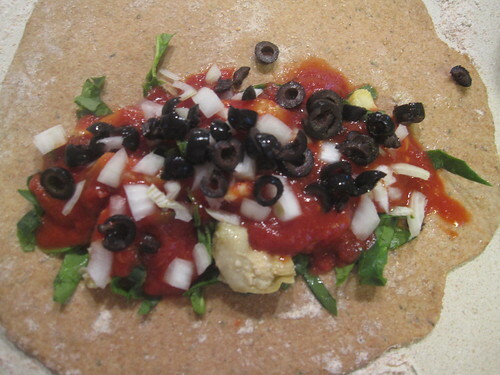 In the one I’m preparing, you’ll need some pizza sauce (a 50/50 mix of tomato paste and tomato sauce with some seasonings will also work), sliced black olives, 1/4 onion diced, about a cup of thinly chopped spinach, and 1/2 cup or so of cooked artichoke hearts. Cooked artichoke hearts? They’re the remnants from the fried rice with artichoke hearts meal prepared last week. As with last week, the cost of everything save the artichoke hearts is really low. I recommend waiting until artichokes are on sale before making this dish. The first step, of course, is to cook the artichoke hearts. It’s pretty simple to do. Rather than just repeating the procedure from last week’s post, though, I’ll just point you back to the original article. Cooking artichoke hearts is quite simple, but you can purchase canned ones if you don’t want to go to that effort. First, you’ll have to make the dough. The ingredients for this part are listed above. Take the water and heat it until it’s warm (but not hot) to the touch, then add the yeast and stir. Let the water sit for fifteen minutes. The surface of the water will have a few bubbles on it, which is perfect – the yeast is active and working. While the water is sitting, mix the dry ingredients together in a bowl (the flour and the salt). When the water is ready, add the liquid ingredients (the yeast water and the olive oil) and mix them thoroughly until you have a dough ball that’s not sticky to the touch, but holds together well and is soft and pliable. If it’s really sticky, add more flour and mix for a bit longer. If it’s dry, add a bit more water and mix for a bit longer. Once the dough is finished, let it sit covered in a warm place for two or three hours to rise. When the dough is rising, get your other ingredients ready: the sauce, the artichoke hearts, the onion, the black olives, and the spinach. 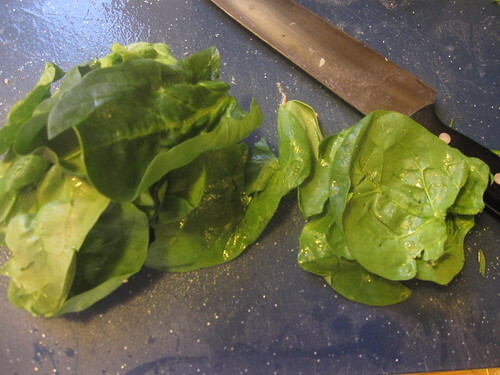 When cutting up the spinach, what I usually do is take three or four leaves, cut the stems off, and make a stack of them. Then, I roll the stack up until it looks like a tube, then I slice the tube about every quarter inch. This leaves me with a bunch of spinach strips, which are perfect for this. 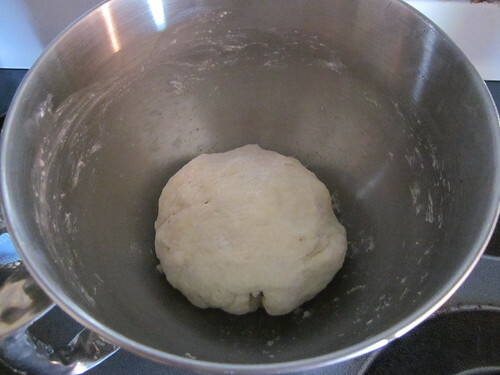 When the dough is finished, just spread it out into a circle, then add toppings to half of the circle, like so. Fold the empty half over the topping-covered half, press down the seams, cut a few tiny slices in the top of the calzone for venting, put the calzone on a baking sheet (I usually put some parchment paper underneath it), and bake it in the oven at 400 F for 18 minutes. You’ll have yourself a wonderful calzone. This is, without much of a doubt, my favorite dish I’ve enjoyed over the last several months. It’s just delicious. Obviously, when making a calzone, you can use any pizza topping as an ingredient. I’ve had all kinds over the years, from a bratwurst-and-sauerkraut calzone to a ham-and-pineapple calzone. Anything that you would put on a pizza works here!